The dust in galaxies consists of small grains of carbon, silicon, iron, aluminium and other heavier elements. The Milky Way has a very high content of carbonaceous dust, which has been shown to be very rare in other galaxies. But now a similar type of dust has been found in a few, very distant galaxies that researchers have been able to investigate using light from gamma-ray bursts. Dust particles play a decisive role in the formation of planets and thus also for the understanding of our own existence on Earth. Galaxies are complex structures comprised of many individual parts, such as stars, gas, dust and dark matter. Even though the dust only represents a small part of the total amount of matter in a galaxy, it plays a major role in how stars are formed and how the light from the stars escapes the galaxies. Dust grains can both absorb and scatter light. Gamma-ray bursts come from massive stars that explode when the when the fuel in its core is exhausted. The explosion causes the dying stars to emit powerful bursts of light that astronomers can use to analyse what the galaxies are comprised of. Specifically, they can measure the elemental content and analyse their way forward to the properties of the dust properties by examining the light that escapes from the galaxies. GRB180325A was detected by Neil Gehrel's Swift Observatory (NASA) on 28 March 2018. Swift is a satellite mission that detects gamma rays from the dying stars. When such a detection from the satellite hits the astronomers, a hectic period begins. The astronomers try to observe that part of the sky as quickly as possible in order to secure the crucial information that allows them to study the interior of the galaxy the explosion originated from. In this case Kasper Heintz, who did his master's thesis at the Niels Bohr Institute and is now a Ph.D. student at the University of Iceland, was on duty. He activated the Nordic Optical Telescope (NOT) at La Palma, where Professor Johan Fynbo from the Niels Bohr Institute was observing for another project. The first observations of the light from the gamma-ray burst were secured only a few minutes after the discovery by Swift. 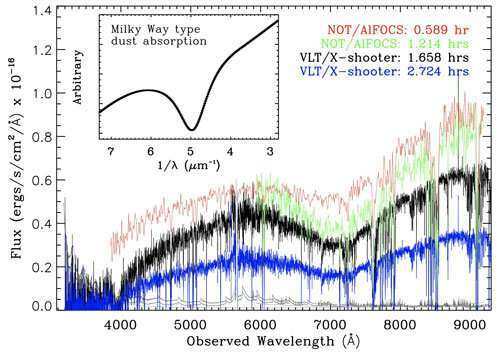 Spectra of the afterglow from GRB 180325A taken with the NOT and the ESO/VLT X-shooter. The dust bump is seen as the downward bulge, which is in the spectrum around 7000 Å. For comparison, you can see the Milky Way dust bump in the small inset to the left.